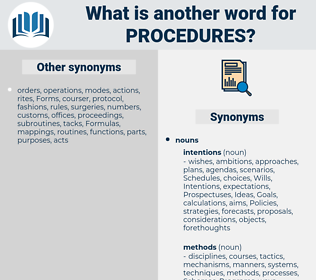 What is another word for procedures? workings, solutions, how-tos, states, documents, instruments, patterns, acts, safeguards, actes, skills, Les, Crimes. production, supervision, PROCESOS, documents, constitution, outcome, evaluation, Followed, screening, report, reports, agreement, concepts, instruments, guidance, characteristics, driving, monitoring, dispute, inspection, personnel, management, oversight, contributions, patterns, des, input, guideline, Guidelines, convenient, service, marches, organization, assistance, acts, incident, assessment, agency, personal, deeds, formula, business, ECB, industrial, first, survey, tracking, functional, security, ADR, mandate, mandates, safeguards, Of, ahead, actes, The, quality, annex, skills, FATF, From, Les, Crimes, cs, political, Them, ad, control, controls, safety, hard, time, run, united, line, LINEs. 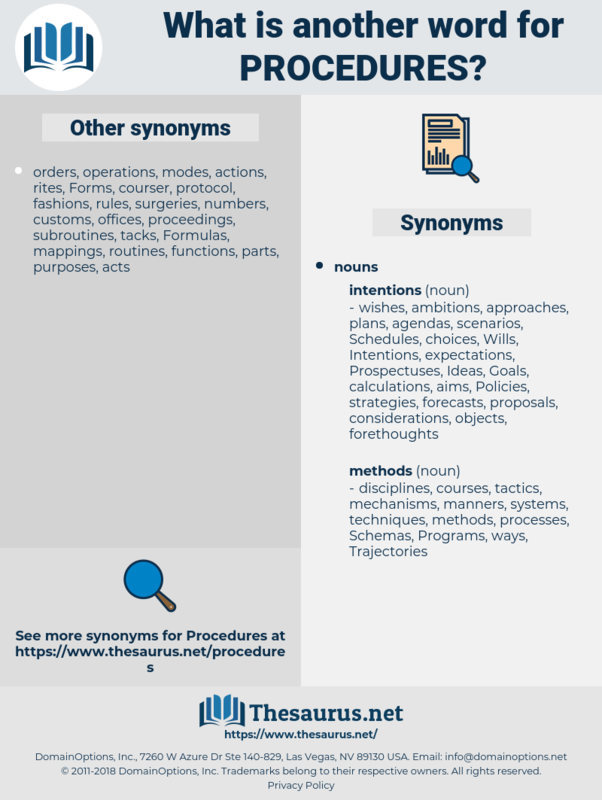 producers, principles, proceeds, purposes, protocol, products, preconditions, communications, circumstances, procures, preparations, precautions, document, codes, Recommendations, endeavours, transactions, structures, closures, jurisdictions, authorities, implementation, Consultations, customs, dossiers, surgical, deliberations, investigations, yes, Schemas, simplified, Exercises, years, treatments, matters, specifications, courts, laws, authorisations, examinations, agreements, proposals, Gestures, complaints, representations, devices, sources, Evaluations, sessions, Undertakings, applicable, practicalities, applied, Resources, priorities, Criteria, sops, speeds, deposits, memoranda, memorandum, dealings, Operators, disciplines, Negotiations, contents, qualifications, statutes, disputes, decisions, features, tactics, programmers, rapporteurs, times, responsibilities, therapies, D, costs, Delays, manufacturers, inspections, checks, Efforts, alternatives, mandate-holders, by-laws, clean-up, tenders, workings, performances, L, FORMATS, dispositions, demarches, Schedules, organs, conventions, committees, burdens, issues, Paths, exemptions, strategies, Phases, inputs, trends, Filings, acquisitions, contexts, appeals, held, Remedies, Contingencies, parliament, relations, services, grounds, objectives, institutions, contracts, holders, Duties, auditors, Registries, infringements, tools, Permits, Organizations, offences, developments, circuits, allegations, Pleadings, derogations, occasions, conservation, samples, parameters, registers, duly, Disparities, audit, audits, roads, Forums, Drills, framework, frameworks, experts, lawsuits, Adjustments, issuing, instances, clearances, names, allowances, Addresses, Tracks, points, others, diagram, representatives, Publications, Inquiries, aspects, offers, settings, norms, requests, borders, EXAMS, permanent, Capabilities, assets, stages, reviews, improvements, shares, Industries, authority, tribunals, solutions, things, tracing, supplies, particulars, shapes, media, subjects, notes, Bodies, implants, affairs, Surveys, primary, Possibilities, files, incidents, degrees, PATHWAYS, milestones, Entities, Penalties, questions, tasks, designs, incumbents, invitations, item, benefits, kinds, Opportunities, results, days, Capacities, sales, Agencies, waterways, pleas, speakers, Vehicles, variants, employees, comments, stairs, elements, Formulas, warrants, levels, Governments, attempts, remarks, parts, lists, holding, debates, variations, Analyses, logistics, Trees, wages, executives, demands, Fees, officers, managers, sanctions, Denied, challenges, launch, attacks, books, trips, Charges, drawings, walks, markets, materials, limitations, funds, texts, events, estimates, views, powers, Ones, obligations, accounts, Taxes, members, violations, agents, chances, flows, sets, see, claims, Styles, Salaries, LANES, Rights, Abilities, -rrb-, Parties, calls, 29, Goals, B, avenues, links, 1.10, changes, 1.5, Bis, documents, Bases, 2.1, report, reports, concepts, instruments, characteristics, inspection, personnel, meetings, contributions, patterns, Guidelines, marches, acts, deeds, mandates, safeguards, skills, Crimes, controls, routines, LINEs. Provided, Stipulated, moved, Referred, Acted, proceedings. points, stages, designs, challenges, claims, acts, routines, proceedings. procedural, proceeding, proceedings, prosecution, prosecutions. applications, declarations, trials, hearing, Hearings, discussions, settlements, Tests, Litigations, proceedings, prosecutions.